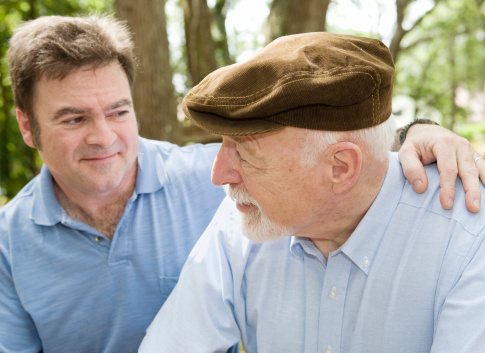 It can be challenging to care for an elderly parent in need of daily attention. Approximately ten million Americans are currently serving as caregivers for a parent with Alzheimer’s, or another form of dementia. As the population ages, these numbers will only increase. Having to care for a parent with dementia can be a hard, stressful, and an often times burdensome task that does not come easily to anyone. There is no instinctive response or technique to fall back on as your loved one’s faculties gradually decline. However, this does not mean it is impossible to care for them. It is within your power to provide proper care for your parent at home, but this requires knowing how to take care of yourself too. 1. It is important to accept your role. You may not see yourself as a caregiver if you are only helping your parent with laundry or garbage collection once a week, for instance! But if your visits are necessary, rather than social, you are a caregiver. By accepting your role you can begin to take further steps to make things easier for both your parent and yourself. 2. Your parent’s faculties will continue to decline over time, possibly over the years. Educate yourself about the specific form of dementia (Alzheimer’s, etc.) and learn about how it can progress. Every case is different, but there are enough commonalities that you will be able to prepare yourself, and possibly even prepare your loved one, ahead of time. 3. Caring for a parent with dementia at home will affect your job and finances. If not now, then it will down the line when your parent’s condition advances. Try to arrange flexible conditions from your workplace so that you will be able to better manage your time and priorities. Unfortunately, in advanced dementia cases, providing home care can be a full-time job in itself. Prepare for the possibility of having to leave your job and assess what your options are. 4. Consider natural treatments for your parent’s dementia. While they will not halt the progression, there is evidence that things such as music, pet therapy, vitamin E or gingko can improve the mood and slow the deterioration of those with Alzheimer’s or other forms of dementia. 5. Perhaps most importantly, don’t try to tackle being a caregiver alone. The stress and demands can take a toll on both your mental and physical health if you don’t have the right support network. Make sure to have support from friends, spouses, siblings or doctors. Take advantage of the resources and support groups available online to speak with other caregivers—you can ask them for advice, have some companionship or just vent! If possible, consider enrolling your parent in a day program. It provides them with professional staff and social interaction and will give you some time for yourself. Your parent may refuse something, such as a shower or food, or insist on a certain course of action. This situation can escalate into combative behaviour. It can be startling when your parent begins to hit, kick, or bite in an attempt to resist something that previously was normal or a non-issue. The most important thing in this type of situation is to avoid engaging in an argument; try to restrain your parent, but also find out what the trigger is. If they object to a certain food for instance, it could be the texture or temperature they dislike. Often, physical discomfort, fear, feeling helpless or an unfamiliar situation is a common cause of aggression in a dementia patient. Calming your parent down may require different methods, depending on their personality—some people will resist attempts to “fuss” over them while others require physical contact for reassurance, for instance. As your parent’s dementia progresses, they may forget who you are, where they are, or the date. In addition to being a painful experience for you to go through, it can be difficult to explain or correct your parent’s inconsistencies. Often, there is little point in lengthy explanations. Instead, try to point to concrete items like photographs or to redirect their attentions to another activity. Phrase corrections as suggestions rather than admonishments in order to prevent your parent from becoming defensive or hostile. In some cases, such as when your parent is mistaken about the date, it may be helpful to “travel with them” and accept their current reality for the time being. The idea of a “therapeutic lie” can be difficult to swallow, but it can be helpful. Difficulty with formerly routine tasks, unfounded assertions or beliefs, or odd behaviors such as hoarding or repetition can all occur as your parent’s dementia advances. Depending on when these signs develop, your parent may try to hide them from you or rationalize them away—after all, they don’t want to admit their faculties are declining any more than you likely do. Impaired cognition can have serious consequences if, for instance, it causes your parent to fall behind on bills or other financial necessities. If you suspect something is wrong, try to look at your parent’s bills or the checkbook—do some math to see if they are staying on top of things. When discrepancies appear, make small inquiries while staying encouraging or reassuring (such as suggesting a bank error first, for instance). Blatantly challenging your parent on their dementia is usually a bad idea, but be prepared for having to take the first steps in offering to provide further help. It can be painful to watch someone you love go through a progressing dementia. A certain level of mental distance may be needed to avoid taking their aggression. Providing home care for your parent might not only be draining, it could affect your personal life—so it is essential that you set some time apart for yourself. This could include anything from group outings with your friends, joining a support group or taking a personal vacation. Don’t feel selfish for wanting some relief. Your well-being is also an important part of any home care treatment you can provide a loved one who suffers from dementia. “Caring for Parents with Alzheimer’s or Dementia.” WebMD web site, http://www.webmd.com/alzheimers/features/alzheimers-caregivers-sandwiched-between-parenting-your-kids-and-your-parents?page=2; Last accessed July 17, 2015. “Dementia Care Dos and Don’ts: Dealing with Dementia Behavior Problems.” APlaceForMom.com. February 8, 2013; http://www.aplaceformom.com/blog/2013-02-08-dealing-with-dementia-behavior/. “Memory Loss and Confusion | Caregiver Center.” Alzheimer’s Association web site. http://www.alz.org/care/dementia-memory-loss-problems-confusion.asp, Last accessed July 17, 2015.